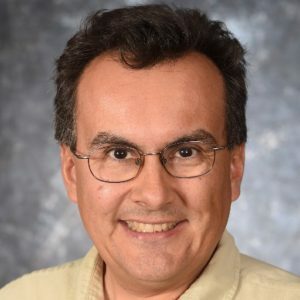 Dr. Dave DuBois is the State Climatologist for New Mexico, director of the New Mexico Climate Center, and associate college professor at New Mexico State University. He provides climate and climate change information and education to policy makers, the agricultural community, industry, educators, and the public. He also gives numerous talks and holds workshops every year on topics covering climate, drought, air quality, climate change, and climate monitoring. Dr. DuBois teaches and trains students in the Plant and Environmental Sciences Department at New Mexico State University and maintains an active research program in air quality and climate, conducting studies to understand the nature and origins of atmospheric particulates that we breathe. He is also the New Mexico Community Collaborative Rain, Hail and Snow state coordinator and looking for more volunteers from all corners of New Mexico to join. Although he is a native New Mexican, he grew up on a farm in rural southern New Jersey and collected weather data as a child. Dr. DuBois holds physics degrees from Rutgers and NMSU, and a doctorate in Atmospheric Sciences from the University of Nevada Reno.